Google announced plans on Friday to shut down the company's URL shortening service Goo.gl starting April 13, 2018. Google won't change or disable existing links; all existing links will continue to redirect to the link target. Google launched goo.gl back in 2009 when URL shortening services such as TinyURL or Bit.ly were all the rage thanks to the rise of Twitter, messaging applications and services that limited the characters that users could type and to improve the sharing of links. Google entered the niche late and we asked back in 2010 whether anyone needed the Google URL Shortener as it did not really offer anything that popular services did not offer already. Google launched g.co in 2011, another URL shortening service that it uses for internal links exclusively. In other words; only Google could use g.co to shorten URLs. 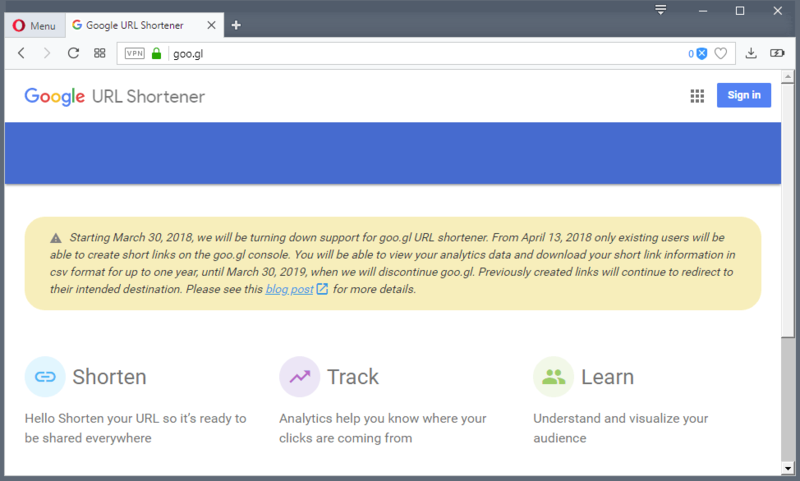 Google's URL shortening service worked similarly to others; users could paste any URL into a form on the Google URL Shortener website to turn it into a shorter URL that was easier to share or publish. While this was beneficial for the purpose, shortening services introduced issues of their own. Spammers started to use the services to obfuscate the target URL and pass spam detection tools and services at the same time. Extensions and services started to appear to reveal the actual link target of shortened URLs. To name a few: URL X-Ray or Unshorten Link. Google's solution required a Google account and included public click analytics. All you had to do was to append .info to any goo.gl link to display click statistics for any link. To refocus our efforts, we're turning down support for goo.gl over the coming weeks and replacing it with Firebase Dynamic Links (FDL). FDLs are smart URLs that allow you to send existing and potential users to any location within an iOS, Android or web app. Google wants developers to use the Firebase console and API instead. Information about the Firebase Console is available on this web page. April 13, 2018: Any user who never created a short link before using goo.gl and anonymous users won't be able to create links anymore. March 30, 2019: Creation of new links for existing users, services and applications. Link continue to redirect properly. Goo.gl console is shut down for good. I’m not affected by the goo.gl shutdown, in fact it’s always been included in several of my system-wide blocklists, and not only goo.gl by the way, several other shortening services with a sufficient bad reputation to be considered “blocklistable” by privacy lists. TinyURL doesn’t appear on any of these blocklists which is why I’ve been using this shortening service exclusively for years. Shortened urls in general: I check (“unshorten”) such links with dedicated web services, mainly CheckShortURL and occasionally URLex. I appreciate shortened urls including a preview, feature not available with all shorteners, available with TinyURL : I believe it is considerate for others to hand them a shortened URL with preview, especially nowadays and when the context is that of strangers to one another. countdown to fdl failure and google shutting this down starts now… 5.. 4..
..and yea, not using this. I may unknowingly use it on some app I get sometime, but as far as general links outside these specific apps, not gonna happen. (that’s how I use goo.gl right now…). Both that he has in the beginning. TinyURL and Bitly. which allows the use of a Bookmarklet. (ready for pasting somewhere else). In one step, after being clicked. it auto copies the page Short URL to your Clipboard. – The tinyurl Bookmarklet does NOT do this. and you need to manually COPY the short URL. A real pain…too many steps. with a Bookmarlet as described in  above?. It offers a choice of four link shortening services, but only one of them incorporates SSL with the other three being HTTP only. I have a special and strong dislike for URL shorteners, so one fewer of them makes me a little happier.